Running With The Pack A.D.
Becky Black and Maya Miller are hitting the road with a new album, a new label and the same old van. When Becky Black is asked if that quote applies to The Pack A.D. she laughs wryly. No, not the first part, she says, but the second part does. 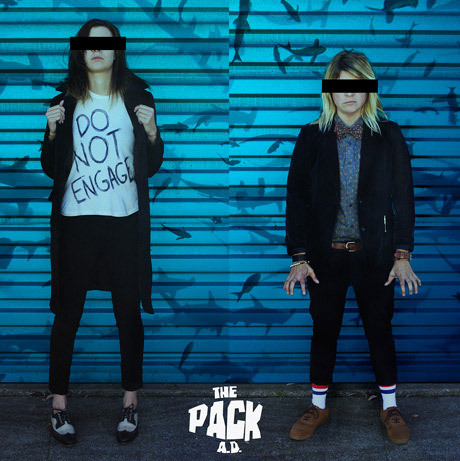 Today the musical evolution of The Pack A.D. has culminated in their fifth album Do Not Engage. It’s their debut on the Nettwerk record label; with the album being produced by Jim Diamond (White Stripes, Dirtbombs). Miller says Jim’s instincts are very much in line with theirs. With a new album comes a new tour and the schedule is relentless. Though they are veterans of the road, Becky admittedly says she’s a bit of a homebody and gets at little anxious at the beginning. Once they get rolling it’s okay. “There’s something about touring that has a bit of consistency, yet everyday is different.” How has touring changed for the Pack A.D.? Becky recalls, “In the beginning we were trying to be as cheap as possible so we never got hotel rooms and we didn’t eat very much. I guess we could have but then we would have gone into debt. We lost some weight and not in a good way.” Laughingly Becky says, “Now we can afford hotel rooms and food, so it’s changed in that way. We’ve still got the dirty old van though. A day in the life of The Pack A.D. on tour consists of getting up, driving eight to ten hours if in Canada, maybe read a bit, get to the venue, load in, sound check, wait around, do the show, go drinking afterwards and go to sleep. Then do it all over again the next day. Though it appears to have Groundhog Day consistency, things do happen and Becky shares a tour tale. There is absolutely no ambiguity about the commitment of Becky Black and Maya Miller. Their fan base is growing like crazy and one only has to listen to hear they are all in, giving everything they’ve got on the stage. Becky was asked if there was anything she’d like to tell people about The Pack A.D. “Ah…no,” was the simple reply. “I don’t even really have stage banter,” she says. Becky Black prefers to let the music speak for her and the music is loud and clear and fierce.